Smith Longhorns raises Registered Texas longhorns in Killdeer, ND. Hello! 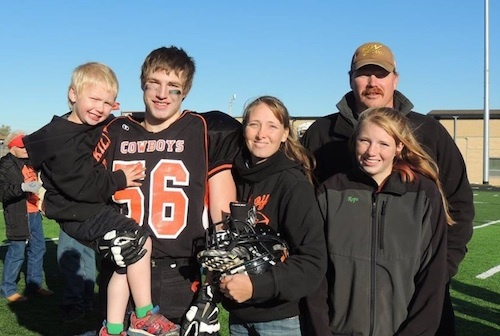 We're Chad, Janell, Rope, Bailey, and Cinch Smith from Killdeer, ND. We originally raised longhorns for the purpose of having our own roping cattle. As we looked for new bloodlines to add to our herd we found an exciting industry that fit not only our interests, but also our lifestyle. We both have jobs "off the place" and stay busy with the kids and their activities. We are still active with rodeo and spend a huge amount of our time in the arena at our place with our own kids and many neighbor kids. Now that the kids are a little older, they have become interested in the cows as well. This has turned our operation into a full-fledged family endeavor! Our main goal is to keep improving the quality of our herd through both our bull and our cows. If you're ever up north, stop by and check us out!